• Over 50 of the worlds best graffiti fonts together for the first time! • $50 discount for all who purchased GF 2.0 & $25 off if you bought GF1. The Graffiti Fonts™ 3.0 Font Collection is here! The official Graffiti Fonts™ 3.0 collection. Now over 50 fonts in all, this collection features leading graffiti style fonts from around the world. Both free & commercial fonts are included in TrueType & OpenType formats for use on virtually any Mac, PC, or Linux computer. The Graffiti Fonts™ collection covers wildstyles, tags, stamps, gangster styles, old skool styles, tribals and more. Over 120 high resolution images over 1700 pixels in width at 180 dpi. (big enough to use for print graphics) This collection of Hip-Hop, art & music themed stock photos & images is very usefull to designers and web deveopers working in those industries. 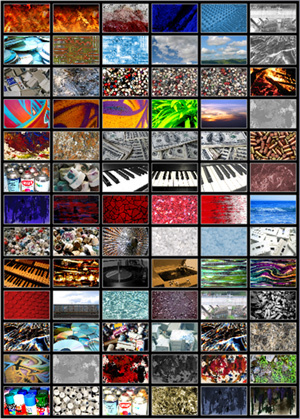 Use these images as backgrounds, fills, textures or wrap them around your 3D objects. Basic, blank templates for CD's, mini CDs, DVD's, & cassette Tapes. These templates help you create graphics packages without all the time spent in setting up measurements. A small collection of vector drawings from Highground & the open clip-art gallery including 3 busses, Highgrounds Subway car templates, a cityscape & a few other items. 8 files in all in svg format, best opened with inkscape. 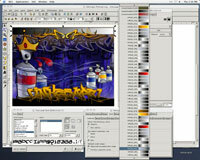 Graffiti trains provided in multiple sizes & formats including bitmap formats. 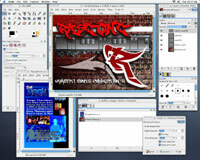 The worlds most popular, open source image editor. The Gimp is similar in function to Photoshop & other bitmap image editors. With this app you can create or manipulate images in virtually all popular formats. Paint, use fonts, import photos & images & use an ever expanding array of effects and filters to create high-end digital art. 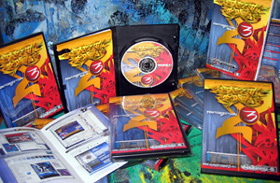 This CDROM also includes VectorGraff™, a simple vector drawing application with which you can create everything from technical drawings to logos, use fonts, add text to images and more. Created by Highground this tiny (under 1mb) app can travel with you on a USB drive or any other storage media.VectorGraff runs on virtually any Windows, Mac or Linux operating system and can even run right from this CDROM or any disk. Layers, Transparency, Custom Gradients & more are all available in VectorGraff. All Typefaces and artwork are the property of Highground Industries & Fulltime Artists © 1991 - 2018 unless otherwise noted. Unauthorized duplication is strictly prohibited. Fonts, Art and all other materials on this site are wholely owned by thier creators and may not be redistributed in any way or under any other name without advance written consent.